Shelley Bean: Something Other than A Card for A Change! Something Other than A Card for A Change! I decided it was about time I made something that was other than a card or scrapbook layout. The Challenge at Scrapalicious USA for this month is to do exactly that. A couple years ago I was at Walmart and spied some really cheap plastic clocks. Cheap as in $3 a piece. I decided to pick up a couple because the possibilities seemed there to make them a little special if I ever got around to it. (Impulse shopping-of course!) This is what they basically looked like. I say "basically" because I just realized yesterday they were 2 very different designs. The other night I got to brainstorming what I could do to turn this into something really special. The 1st thing I had to do was try and take the thing apart. I thought I would actually break it but luckily it eventually came apart by prying the plastic faceplate off. Then I removed the hands from the front and the paper circle with the numbers on it. I was left with the shell of the clock and my own imagination. I knew I wanted to use the cool new Teresa Collins Paper I received from Scrapalicious USA this month. After I inked it up with Tim Holtz distress inks in "Tea Dye", "Vintage Photo" and "Old Paper" I was very happy with old world look I wanted. To give it even more interest I added a Teresa Collins Chipboard Element to the center. Not to be outdone I knew I wasn't quite finished and added some Black Hot Rocks with my I-Rock Tool! (all items available now at Scrapalicious USA!) I am so glad I came up with the idea to add Roman Numerals instead of regular numbers. I used a very cool Cricut Cart that I think is highly underated. It is the "Stamped" cart. The font is very unique and worked perfect for what I was trying to achieve. I also dug through some supplies I had on hand and found a brand new tube of a nifty product called "Rub 'N Buff" that I picked up at Hobby Lobby and rubbed it into the clock to give it that nice gold tone. I simply put the clock back together and sat it on a cast iron stand I had and am very happy with how it turned out! What do you think? Okay, now what is your creativity going to make for our challenge? 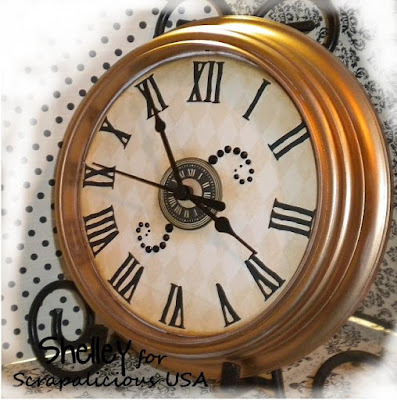 Pop on over to the Scrapalicious USA Blog for more inspiration and join along! You did a bang up job. This is gorgeous. I love it! I love the crafty non card side of things... keep more coming! Wow, you did a fabulous job! TFS your talent and creativity. I'm a new follower. I have been on your blog for almost an hour. A New Giveaway and Other Random things to Share!